The Occupy movement, which is protesting a wide range of perceived wrongs from fat cat Wall Street bankers to social and economic injustice, also is being strongly influenced by communists and socialists, though you wouldn’t know that from reports by the mainstream media. But as this video shows, it is more about those who hate America and want to see capitalism replaced by socialism, even though most of the protesters have no idea of what that would really mean to them. 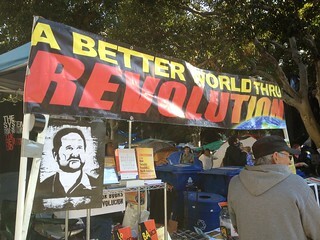 Socialist table at the Occupy LA encampment at City Hall. For more pictures go to my Flickr  gallery.